If you're considering buying a diamond, it's essential that you understand the basics of diamond quality. A chart can help, especially if you're comparing one diamond to another. This handy infographic uses diamond grading information from the Gemological Institute of America. If you wish, you can print it as a helpful reference to use while shopping. Simply click on the chart and save the file to your computer. If you need help downloading or printing, use these tips. Print this diamond quality chart. Color - The color of a diamond has a dramatic effect on its value and quality. Colorless gems fetch the highest per-carat price. Clarity - The clarity of a diamond refers to the number and size of the flaws within the gem. Flawless and near-flawless stones are the highest quality you can purchase. Cut - Cutting diamonds is an art, and it needs to be done with precision and an eye for best showing off the beauty of the gem. Diamonds with a high quality cut have exceptional sparkle. 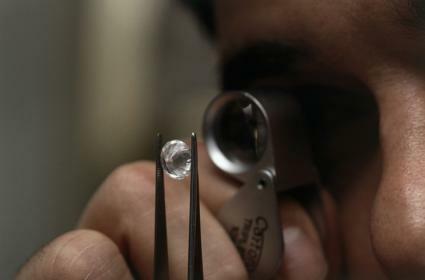 Carat - Carat refers to the weight of a diamond and does not have any influence on the quality of the gem. However, you'll pay less for a high quality diamond if it is smaller and has a lower carat weight. If you're shopping for a diamond, it's easy to get caught up in buying the highest quality stone you can afford. However, the style and metal color of the setting can make some of these characteristics more important than others. Know which aspects of diamond quality are most important to you, so you can choose the diamond that best fits your own needs.